India can get 3 bn $ ship in 100 mn $,if our government is willing to purchase it. 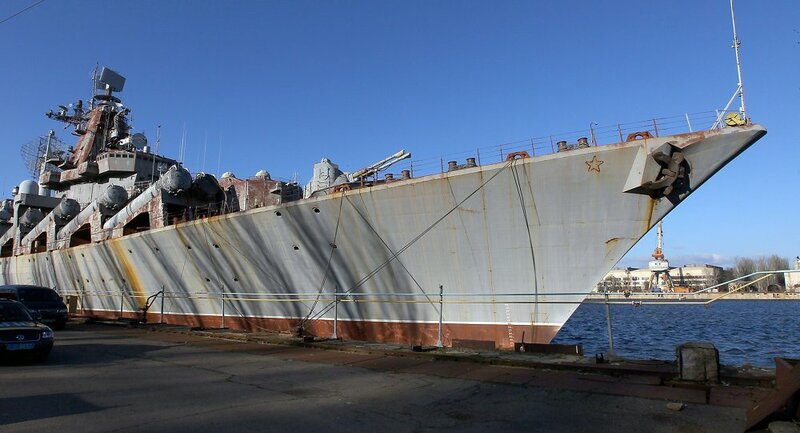 Ukraine can’t maintain the ship as it costs USD $225,000 per month, while India can easily afford it. The ship has been armed with 16* P-500 Bazalt anti-ship missiles which can be replaced by Brahmos,64 S-300PMU long range surface to air missiles,40 OSA-MA SR SAM,1 Twin AK-130,6 AK-630 CIWS,2*RBU-6000 Anti-submarine mortars and 10 Torpedo tubes. This ship has also lots of sensors and processing systems. This ship can complement 480 personnel and its range is more than 13000 kms. So,if India buys this ship it will be win-win situation for both the sides. India will get ship strategic ship against China and Ukrainian shipyard will get rid from ship and debt. Ten ships were planned, with three completed, with the Ukrayina’s construction halted shortly before completion after the Soviet collapse. The three completed ships, the Moskva, Marshal Ustinov and Varyag remain in service in the Russian Navy, in the Baltic Sea, Northern Fleet and Pacific Fleet, respectively. All three ships have seen comprehensive overhauls and modernization.